How do we Idenditify Sedimentary Rocks? MOST OF THE EARTH'S SURFACE IS MADE UP OF SEDIMENTARY ROCKS. There are three types of sedimentary rocks which are differentiated by how they are formed. 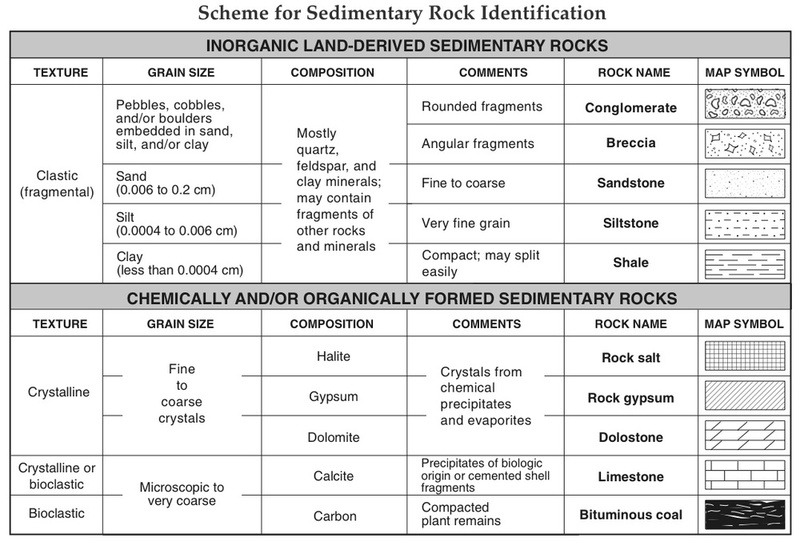 We can see the three types of sedimentary rocks on page seven of the ESRT in the Scheme for Sedimentary Rock Identification. CLASTIC SEDIMENTARY ROCKS FORM FRM THE FRAGMENTS OF OTHER ROCKS. The rock fragments that form clastic sedimentary rocks come from the weathering of rocks that already existed. Wind and water break off particles of rocks which are then collected by running water. When the water slows down, the sediments are deposited. Dissolved minerals in the water act like natural cements which settle into the spaces between the sediments binding them together into firm, cemented rock. CLASTIC SEDIMENTARY ROCKS ARE CLASSIFIED BASED ON THEIR TEXTURE. CHEMICAL SEDIMENTARY ROCKS ARE FORMED FROM MINERAL GRAINS TAHT PRECIPITATE OUR OF WATER BY EVAPORATION OR CHEMICAL ACTON. ORGANIC SEDIMENTARY ROCKS ARE FORMED FROM THE REMAINS OF PLANTS AND ANIMALS THAT DIED MILLIONS OF YEARS AGO. Organic sediments come from the remains of animals and plants. The remains get buried and compacted. Over time, the pressure causes them to cement together into a layer of sedimentary rock. Most Regents questions involving sedimentary rocks require us to interpret diagrams like the one above called Outcrops. They show a series of layers of sedimentary rocks by using different symbols for each type of rock. To answer any questions about these outcrops we need to know what each symbol stands for. Luckily, its all given right to you in the ESRT. On the far right side of the Sedimentary Rock Table there is a column called "Map Symbol". This column shows us how each type of sedimentary rock will be drawn in outcrop diagrams like the one above. Lets Practice: Identify the name of each of the sedimentary rocks shown in the outcrop above.